One of the greatest writers of world literature, Johann Wolfgang von Goethe's "West-östlicher Divan" ("West-Eastern Diwan") was written in 1819. 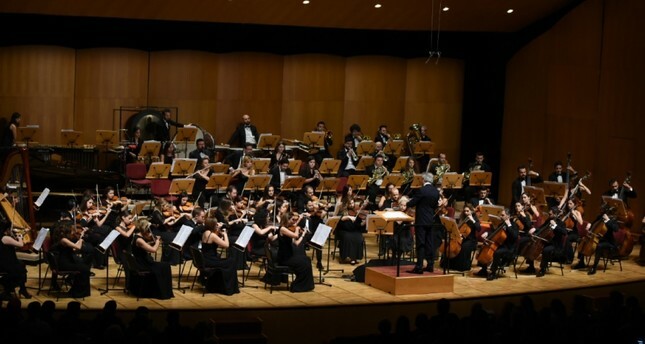 On the 200th anniversary of the work, its symphonic version will be presented for the first time at the Istanbul Metropolitan Municipality (İBB) Cemal Reşit Rey (CRR) Concert Hall. The world premiere of "West-östlicher Divan" will be held on April 15 with the performance of the Cemal Reşit Rey Symphony Orchestra, under the baton of conductor Hasan Niyazi Tura and the Pera Ensemble. The concert, which starts at 8 p.m., will see soprano Ayşe Sinem Ekşioğlu and tenor Caner Akın perform as soloists while baritone Nejat Işık Belen will appear as a narrator. "Divan" was composed by musician Mehmet Yeşilçay and was introduced to the music world under the title "Symphonic Poems for Orchestra, Soloists, Choir and Turkish Music Instruments from Goethe's West-östlicher Divan." The work is a cultural project combined with a social one, meant to reflect the diversity of our world, and to realize a peaceful, cooperative and harmonious life. After the world premiere at CRR on April 15, it will greet listeners in Germany with a performance by the Munich Philharmonic Orchestra on Oct. 26 and in Palestinian Bethelem with its Arabic version in 2020. The tickets for the concert in Istanbul can be bought from Biletix and CRR Concert Hall for TL 20 and TL 30. Goethe showed an interest in Islam more than any other religion apart from Christianity. When he was 23, he wrote a magnificent poem dedicated to the Prophet Muhammad. At the age of 70, he announced to the public that he was thinking of celebrating the holy night meant to commemorate the anniversary of the Quran's revelation from the heavens when it was completed. Throughout his long life, the poet showed his respect for Islam in different ways many times. Goethe compiled the "West-östlicher Divan" inspired by the divan of the Iranian poet Hafez. The work was recognized by the Islamic world as a masterpiece of German poetry. Referring to the necessary services that will be conducted for the future of the Republic by gaining strength from our glorious history where national, heroic, religious, conscientious, mental and intellectual values are protected, late Turkish writer Cemil Meriç says, "Culture must be crowned with knowledge. As a person who knew the West better than many Westerners, I can say that the roots of the West are in the East." Therefore, it can be said that the togetherness of the West and East will be offered to listeners in the symphony of "West-östlicher Divan." Composer Mehmet C. Yeşilçay has been living in Munich, Germany since 1968. He created compositions with the German composer Hans Werner Henze, on oud performances and Turkish music with Cinuçen Tanrıkorur along with studying industrial engineering. He took music lessons from his uncle Hafız Seyyid Nusret Yeşilçay. Some of his performances and concerts include those alongside Concerto Köln and Jordi Savall, Hesperion XXI and the Sarband Ensemble - making him known internationally. Apart from conducting the Pera Ensemble, which he founded in 2005, he has been involved in the arrangement and performance of the works of Eric Satie and Handel and is known for his concerts and symphonic works. In 2012, he directed the "Music for the One God" project, funded and supported by the European Union and the Turkish Government. Various concerts in world cultural heritage places in Istanbul, such as Hagia Irene and a CD released on the basis of this project show that Yeşilçay is not only successful as a conductor and arranger but also as a project leader. With this project, he gave concerts in many German cities, and the German State Television broadcast his concert. "DIASPORA - Lieder aus der Fremde. Composition for Symphony orchestra and Turkish instruments," which premiered in May 2016, had been commissioned by the Staatsphilharmonie Rheinland Pfalz. It was performed four times and won an award. Yeşilçay was also considered worthy of the Echo Klassik Award in 2012. "Although it may seem impossible at first glance to portray this difficult subject as music, it is sure that everyone speaks the language that they can express themselves in. My language is music! 'Divan' is a cultural project with a social claim to reflect the diversity of our world and to be a sign to realize a peaceful and harmonious coexistence. The result of this experience is to cause a theme of conscious, ideal and deep culture, not integration in the sense of assimilation or intercultural dialogue. It is to meet foreigners on eye level with respect, to encourage, to overcome barriers in the heads and to dare to try new ways together. There has been such a period in history that the Turks have ruled, directed and influenced the world. The Ottoman Empire, which was the peak of Turkish civilization, influenced Europe and led to the formation of Turkish fashion (Alla Turca) in Europe. The most well-known of these influences were mainly in art and music," added Yeşilçay.